Are you interested in connecting with other students across AMDSB to share your ideas, collaborate and network with others, and build relationships with new learning partners of all ages using a new digital platform for learning?! 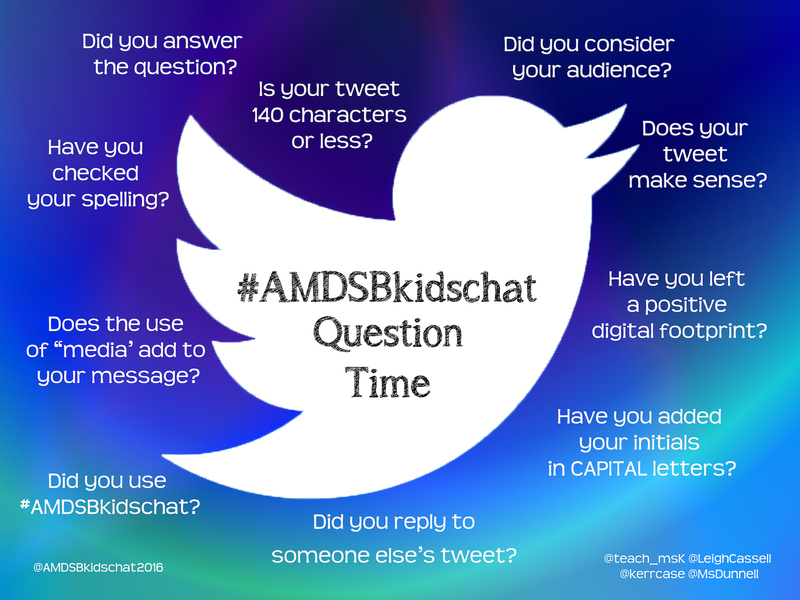 Each month K-8 classes across AMDSB connect for an hour to engage in a #AMDSBkidschat. We discuss topics related to character education, social justice, and citizenship. Each #AMDSBkidschat begins with a provocation in the form of a video. The video and questions used during the Twitter chat are posted on the TLC blog and on Twitter @AMDSBkidschat at the beginning of every month. Common practice for classes is to answer the questions for the chat ahead of time, with a focus on learning a new form of writing, in consideration of a new, more global audience. Time during the chat is spent reading tweets, responding to others, and asking questions to further the conversation. Our goal is to build community throughout #AMDSBLearns and be the change we want to see in the world. Everything you need to get started is linked here! If you have any questions about the #AMDSBkidschat please feel free to contact us!